The Global Volcanism Program has no activity reports for Garove. The Global Volcanism Program has no Weekly Reports available for Garove. The Global Volcanism Program has no Bulletin Reports available for Garove. Garove is the largest of the Witu Islands, which lie north of New Britain. The low, 12-km-wide elongated island is cut by a 5-km-wide caldera that is flooded by the sea through a narrow breach on the southern side of the island, forming Johann Albrecht harbor. The steep-sided caldera walls rise 100-150 m above the sea. Satellitic cones were constructed along the NE and SW coasts. No historical eruptions are known, but the preservation of fresh lava flow structures on the NW coast suggests an age as young as a few hundred years (Johnson and Blake, 1972). Fisher (1957) noted four thermal areas and a solfatara on the island. Binns R A, Brodie P, Fulton R, Mapham B, Park S-H, Parr J M, Pinto A, Rees C, Subandrio A, Thomas S, Wama J, Whiting R, 2002. Exploration and Mining Report 939C (Final Cruise Report, RV Franklin, FR-02/2002, “BISMARCK-2002”): Submarine Hydrothermal and Volcanic Activity in the Western Bismarck Island Arc, Papua New Guinea. CSIRO Division of Exploration and Mining, Australia. Cooke R J S, Baldwin J T, Sprod T J, 1976. Recent volcanoes and mineralization in Papua New Guinea. 25th Internatl Geol Cong, Sydney, Excur Guide, 53: 1-30. Silver E, Day S, Ward S, Hoffmann G, Llanes P, Driscoll N, Appelgate B, Saunders S, 2009. Volcano collapse and tsunami generation in the Bismarck Volcanic Arc, Papua New Guinea. J. Volcanol. Geotherm. Res., 186: 210-222. The Global Volcanism Program is not aware of any Holocene eruptions from Garove. If this volcano has had large eruptions (VEI >= 4) prior to 10,000 years ago, information might be found on the Garove page in the LaMEVE (Large Magnitude Explosive Volcanic Eruptions) database, a part of the Volcano Global Risk Identification and Analysis Project (VOGRIPA). There is no Deformation History data available for Garove. There is no Emissions History data available for Garove. The most prominent feature of Garove Island, located north of New Britain, is a 5-km-wide caldera that is flooded by the sea through a narrow breach on the southern side of the island, forming Johann Albrecht harbor. Satellitic cones were constructed along the NE and SW coasts of the 12-km-wide island. No historical eruptions are known from Garove (also known as Vitu, or Witu), but the preservation of fresh lava flow structures on the NW coast suggests an age as young as a few hundred years. 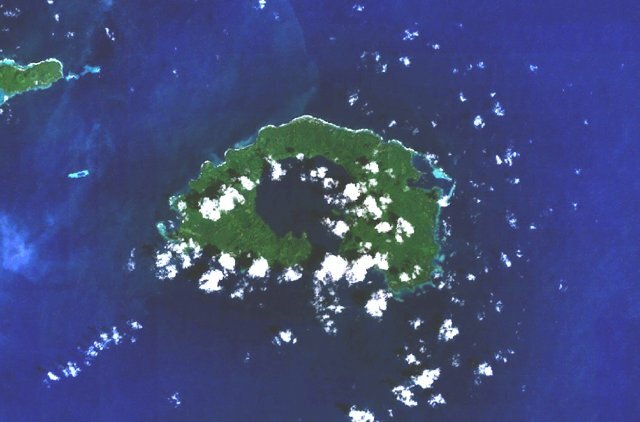 The eastern tip of Mundua Island is visible at the upper left. IRIS seismic stations/networks Incorporated Research Institutions for Seismology (IRIS) Data Services map showing the location of seismic stations from all available networks (permanent or temporary) within a radius of 0.18° (about 20 km at mid-latitudes) from the given location of Garove. Users can customize a variety of filters and options in the left panel. Note that if there are no stations are known the map will default to show the entire world with a "No data matched request" error notice. Large Eruptions of Garove Information about large Quaternary eruptions (VEI >= 4) is cataloged in the Large Magnitude Explosive Volcanic Eruptions (LaMEVE) database of the Volcano Global Risk Identification and Analysis Project (VOGRIPA).